ANN ARBOR, Mich. – Many surgeons write prescriptions for opioid pain medications four times larger than what their patients will actually use after common operations, a new study shows. And the size of that prescription may be the most important factor in how many opioid pills the patient will take – outweighing their pain scores, the intensity of their operation and personal factors, the research suggests. 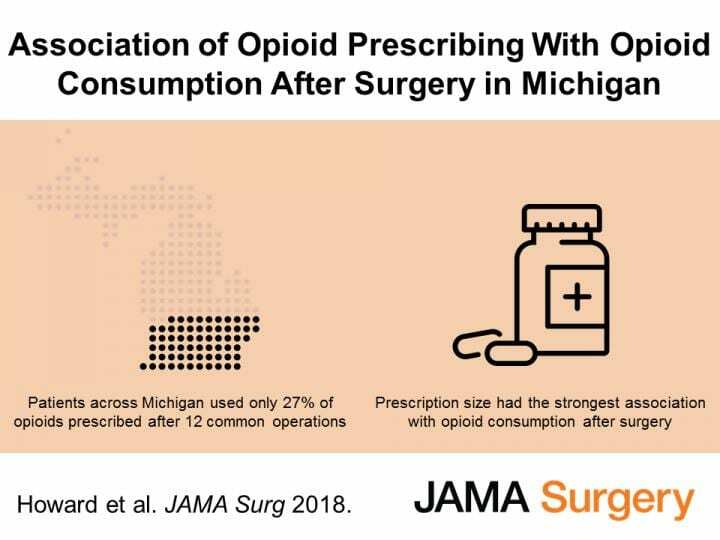 The study, published in JAMA Surgery by a team from the University of Michigan that has studied many aspects of surgical opioids, highlights the importance of using real-world information about surgical patient opioid use to guide prescribing. It also points to a need to provide options for surgical patients to dispose of unused opioids safely, so that the pills aren't misused or lead to a poisoning or overdose. The study used in-depth data from 2,392 patients who had one of 12 different common operations at 33 Michigan hospitals. On average, patients took only 27 percent of all opioids prescribed to them. But for every 10 additional pills prescribed, patients took five of them. The researchers used data from patients who had their operations in 2017, at hospitals that participate in the Michigan Surgical Quality Collaborative, a statewide effort to improve surgical care based on shared data and analysis. The study focuses on a time period after broad public awareness of the opioid epidemic, but before the launch of surgical opioid prescribing recommendations developed at U-M. Those recommendations, based on data from patients at, U-M's academic medical center Michigan Medicine, now guide surgical prescribing at all MSQC hospitals. "It's striking to see the major discrepancy between prescribed amount and the amount patients actually take," says Joceline Vu, M.D., senior author of the new paper and a surgical resident and research fellow at Michigan Medicine, U-M's academic medical center. "This is not a phenomenon of a few outlier surgeons – it was seen across the state, and across many operations." Ryan Howard, M.D., the surgical resident who is the paper's first author, adds, "In what we tell patients about what kind of pain to expect after surgery, and how many pills we give, we set their expectations — and what the patient expects plays a huge role in their post-operative pain experience. So if they get 60 pain pills, they think they have to take many of them." Vu and Howard note that psychology research has dubbed this the anchoring and adjustment heuristic, where the baseline data someone receives – the size of a plate of food, for instance – makes a difference in how much they consume. The research team was done as part of the Michigan Opioid Prescribing and Engagement Network, or Michigan-OPEN, led by two U-M surgical faculty and an anesthesiologist specializing in pain medicine. One of the surgeons, Michael Englesbe, M.D., also heads the MSQC. Funded by Blue Cross Blue Shield of Michigan, MSQC provided a natural laboratory to study surgical opioid prescribing and use. In addition to tracking prescription information, MSQC worked with hospital staff to start a program of calling patients one month and three months after their operations, to ask them about their pain medication use, level of pain and other topics. The median number of pills patients received was 30 – but the median number used was nine. The number of pills a patient received was the strongest predictive factor of the number they used. The next strongest was the patient's self-reported memory of whether they had no pain, or moderate or severe pain in their first week after surgery: those who said they had severe pain took 16 more opioid pills than those with no pain. Tobacco users tended to use more opioids after surgery, while the older a patient was, the fewer opioid pills they tended to take. Not surprisingly, those who had outpatient surgery took fewer opioids, but those who went into their operation with worse underlying health (as measured by the American Society of Anesthesiologists classification system) used more. The researchers also compare patients' opioid across different surgical procedures. Patients who had a hernia repaired – whether through open surgery or minimally invasively – used the most opioids among the 12 operations studied. Patients who had their appendix or thyroid taken out took the least. The researchers did not have information on mental health diagnoses that the patients might have had, specifically depression and substance use disorders, which other U-M research has shown to be associated with higher rates of prolonged opioid use after surgery. They also didn't have information on each patient's prior prescriptions for opioids, or use of opioids before surgery. The U-M team has previously shown that those who go into surgery already taking prescription opioids have worse outcomes and a higher likelihood of going on to prolonged use of opioids long after surgical pain should have diminished. Howard notes that other research has suggested that the more opioid medication a patient is prescribed for surgical or non-surgical pain, the higher their risk of developing an addiction to opioids or overdosing. Other research has shown that many people addicted to opioids of any kind began their opioid use with pills prescribed to them, or taken from others around them. He says, "We hope that by shining a spotlight on the difference between prescription size and actual use, we can empower surgeons to change their prescribing habits, and be a better steward to both their patient and the broader community." Vu, Howard and their colleagues are working to update the surgical prescribing guidelines, adding more procedures. They also hope to work with other collaborative quality initiatives funded by BCBSM and led by U-M physicians, to repeat the study in other patient populations. Now that MSQC hospitals use surgical opioid prescribing guidelines, they will study the before-and-after trends in prescribing and use. In addition to Vu, Howard and Englesbe, the study's authors are Vidhya Gunhaseelen, MBA, M.S., MHA; Jay Lee, M.D., Michigan-OPEN co-leaders Jennifer Waljee, M.D., M.S., MPH and Chad Brummett, M.D., MSQC founder Darrell Campbell, Jr., M.D., and Elizabeth Seese, M.S. Englesbe, Waljee, Brummett and Campbell are members of the U-M Institute for Healthcare Policy and Innovation. The research was funded by the Michigan Department of Health and Human Services and the National Institutes of Health, including National Institute on Drug Abuse grant DA042859.